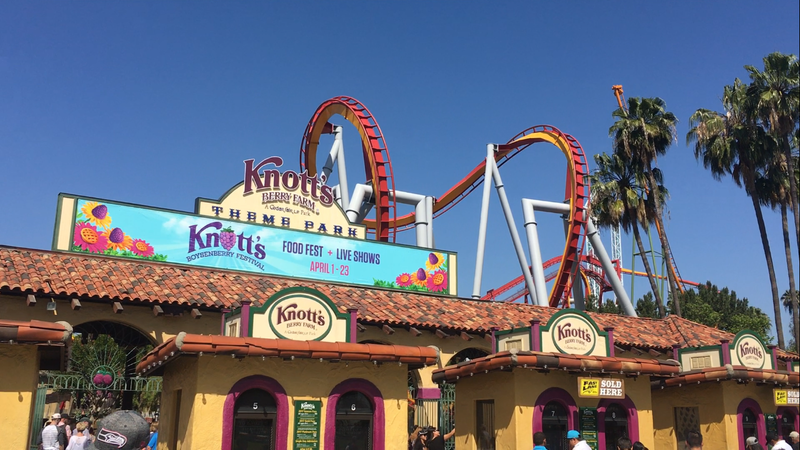 On Thursday, April 20th, my family and I visited our second theme park of the California trip: Knott’s Berry Farm! 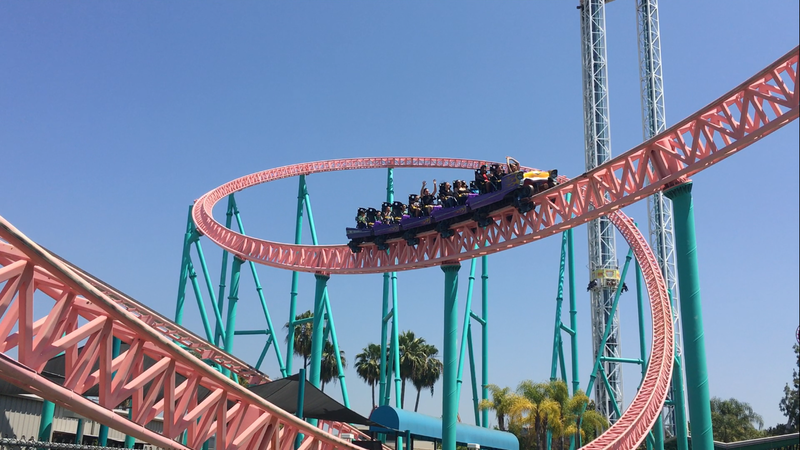 Knott’s is home to loads of different attractions including coasters, flat rides, dark rides, and more. Although we weren’t able to get on everything (albeit only 1/3 of all the awesome attractions they had), but we did get a good feel for what America’s first theme park had to offer. 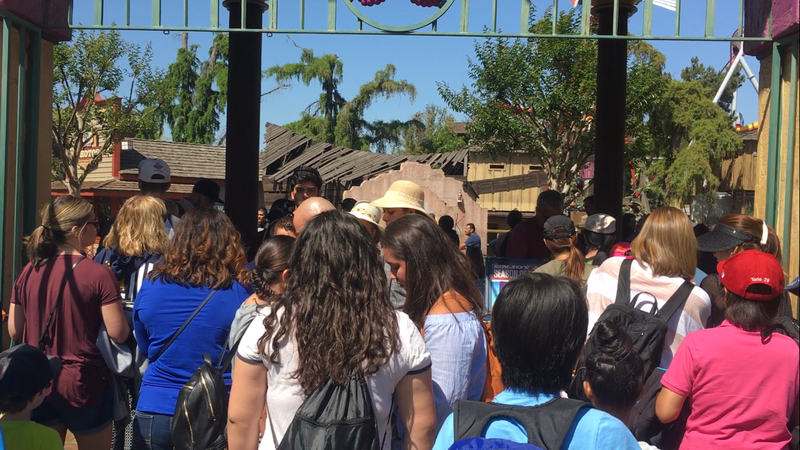 The Knott’s employees did a great job of getting people through the front gates quickly and efficiently! We arrived at the park around 11 am, about an hour after opening. The crowds weren’t terrible, but they were more than we expected for a Thursday. As soon as we entered the gates, we ran right to the entrance of Ghost Rider, the GCI Wooden Coaster. Ghost Rider was huge! It was such a long ride too! Ghost Rider was an AMAZING ride! It was both my favorite coaster at Knott’s and my new favorite wooden coaster. The only problem I had with the coaster was how much of a line it draws in. Other than that, it’s smooth, airtime filled, and the trains are even better than an RMC’s! Terrible picture, but these seriously are the best coaster trains I’ve ever sat in! After Ghost Rider, we walked up through the ghost town, and into the Boardwalk area. I’d say the Boardwalk was easily the least themed area of the park, by far. It still looked decent, but not as on par with “Disney-like” theming as the rest of the park was. The Boardwalk was essentially a bunch of bright colorful rides and buildings thrown together. It wasn’t bad, but it wasn’t good either. We decided to check out Voyage to the Iron Reef, the 3D shooting dark ride of the park. We didn’t really know what to expect from this, but figured we would check it out anyways. Overall, the ride was amazing! It was kind of like the Justice League rides at different Six Flags parks, except waaay better. Not that the JL rides are bad, but Voyage had a better, more original story in my opinion. The gameplay also reminded me of Star Fox 64 for some reason, which made it even more enjoyable (Star Fox 64 is my favorite game ever made). 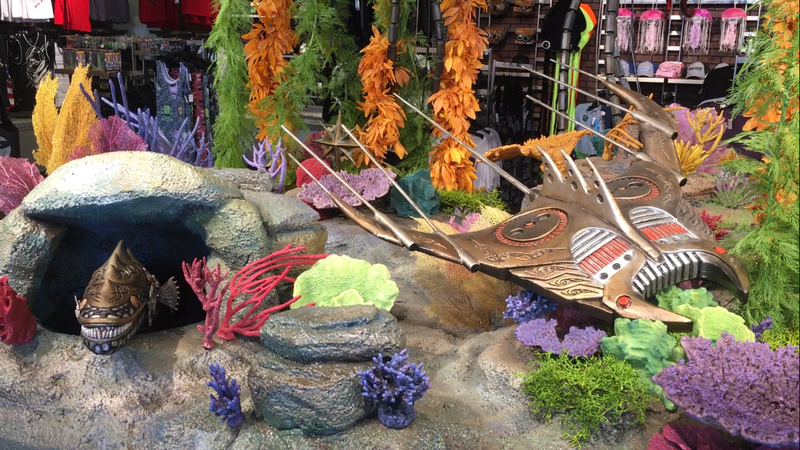 The Iron Reef gift shop also had a pretty cool diorama inside! 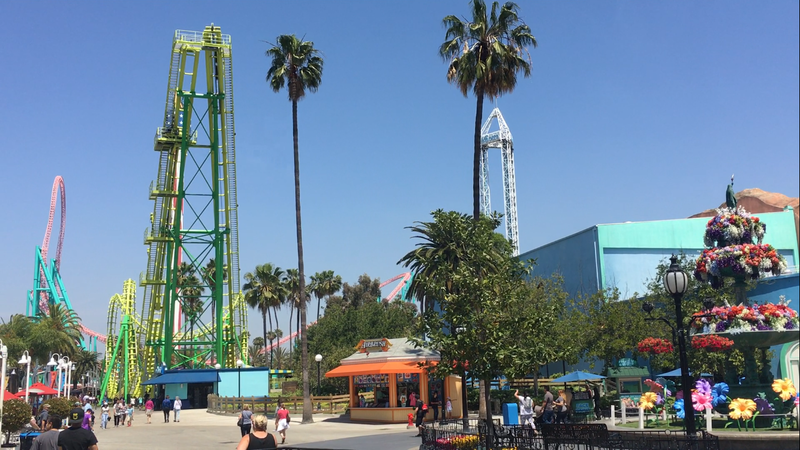 After Voyage, it was time to ride Xcelerator, the 205 ft. tall coaster with an 82 mph launch. This ride was the definition of exhilarating! It wasn’t a super long ride, and it wasn’t quite as good as Ghost Rider, but it was still very good! 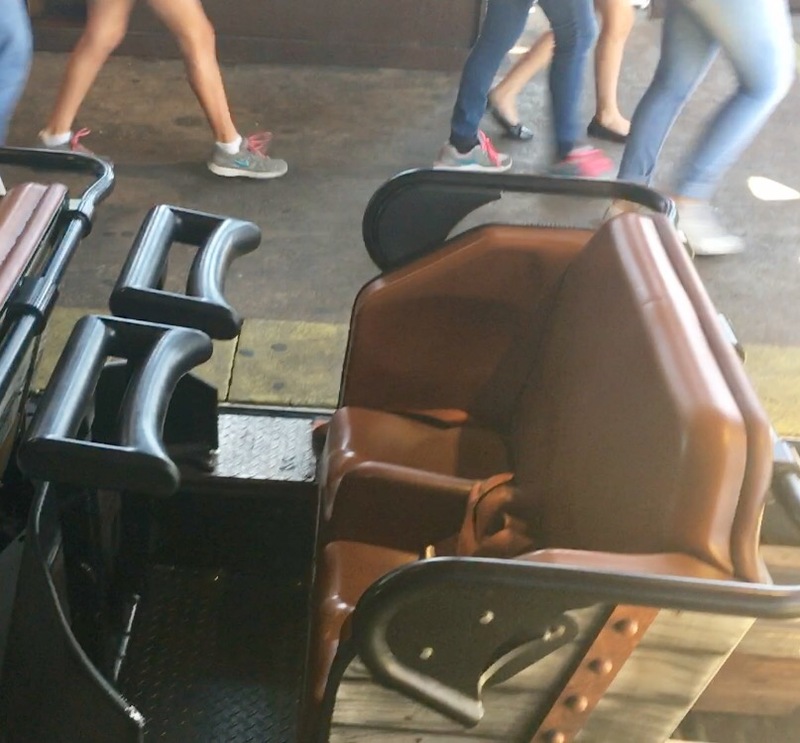 It also only had a station wait, so we were able to ride it twice! 0 – 82 mph in 2.3 seconds. Next up was Silver Bullet. For whatever reason we all had trouble finding the entrance to this one. Usually I’m pretty good with navigating theme parks, so not knowing where to go was kind of a weird feeling. Silver Bullet is such a photogenic ride! 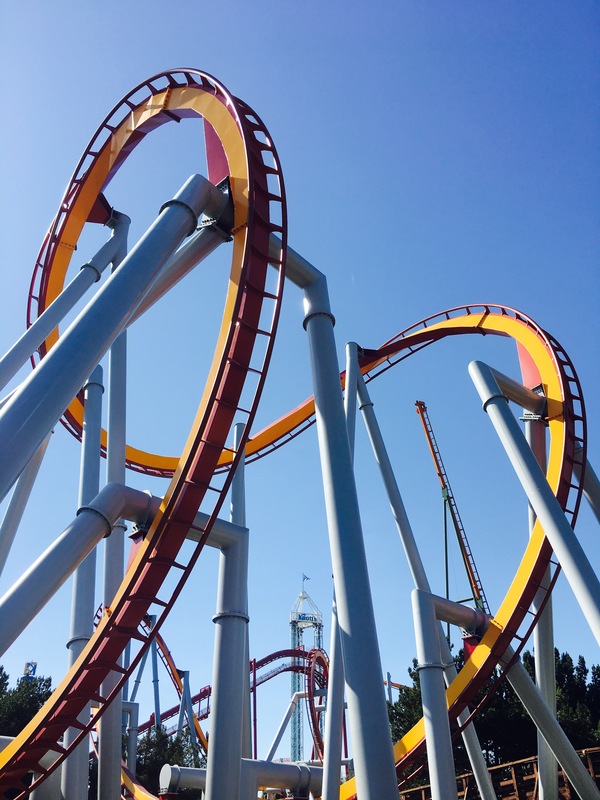 Silver Bullet ended up being a very good ride. I’ve only ever ridden 2 other B&M inverts (both Batman clones), so SB has easily become my new favorite of its kind. I’d like to see how it compares to other fan favorites like Banshee, Talon, or Afterburn. After that, my brother Brandon and I separated from the rest of our family to go get our first (and last) rides on Boomerang. 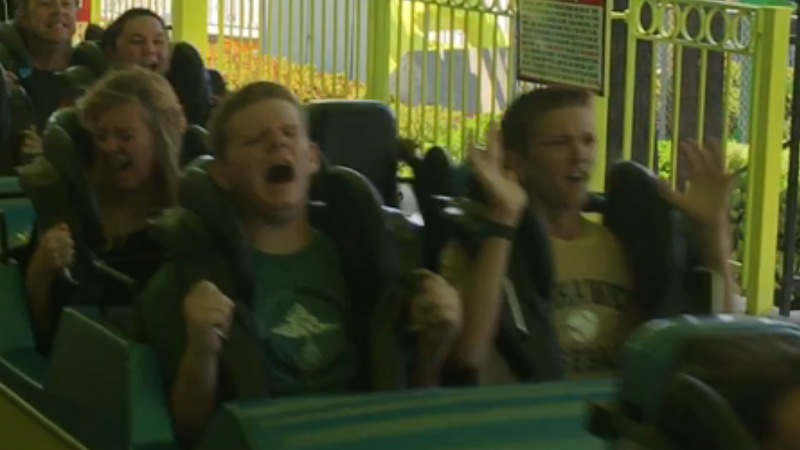 Boomerang was….painful, to say the least. It wasn’t quite as bad as Flashback at Six Flags New England, but it was still pretty rough. The restraints were also terrible. Overall, I’m glad it’s gone now. Accidentally took a picture of this random guy on Boomerang. His face perfectly captures what the ride experience is like. 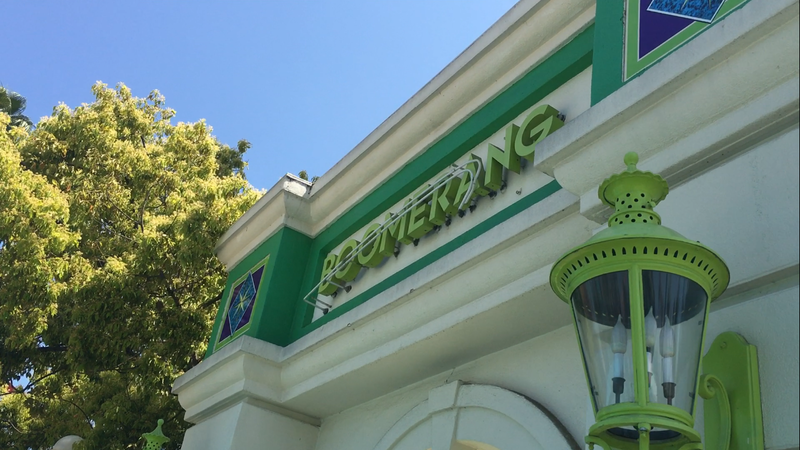 We met back up with our parents to go ride Pony Express, the zamperla launch coaster themed to…riding ponies I guess. It was a decent family coaster, but it wasn’t very long and didn’t really do much. Mediocre at best. Sittin’ on the break run in the scorchin’ hot California sun. Crowds seemed to only be getting worse at the park, and we were already realizing that we would have to cut our visit short. We tried to get on Bigfoot Rapids, but weren’t willing to wait an hour for it. 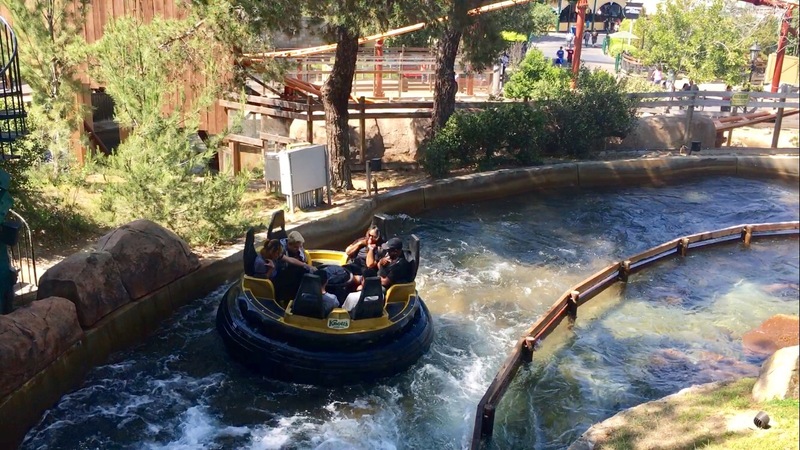 We’ll definitely have to try the rapids whenever we go back to Knott’s! Instead, we walked back into the ghost town to check out the Boysenberry Festival. Although we didn’t get to taste everything, the festival did seem to have a nice selection of boysenberry treats. 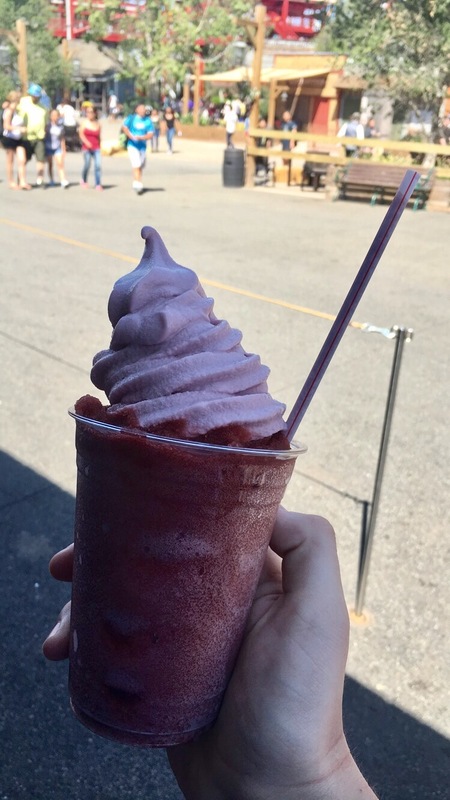 We settled for the boysenberry floats, which were DELICIOUS! We finished our frozen treats around 3 o’clock, and decided we had about two rides left in us. 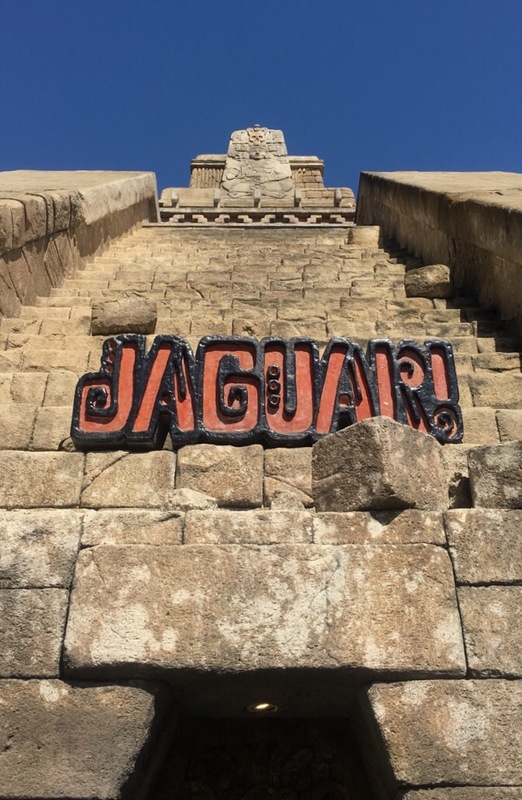 We headed into the Mexican area (which was beautifully themed) to ride Montezoomas Revenge and Jaguar. Probably my favorite entrance sign in the park! We started with Montezooma. 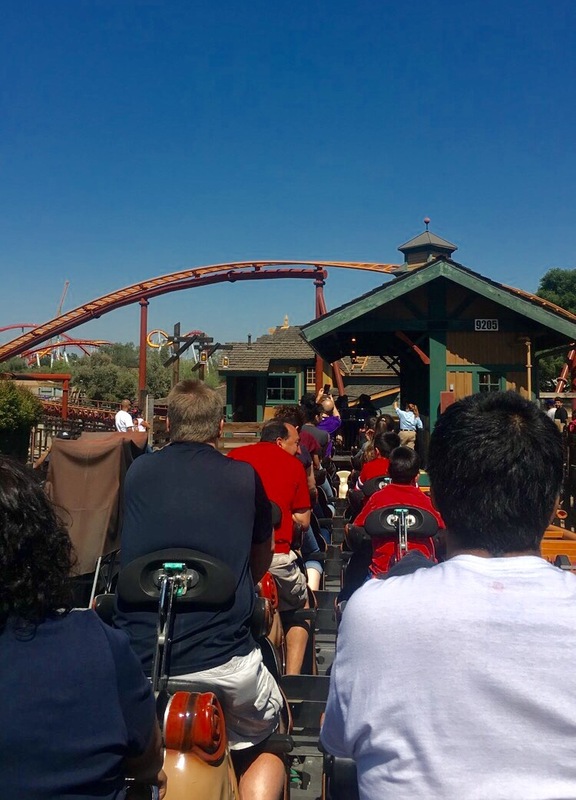 Although it wasn’t an all star attraction like Ghost Rider, Xcelerator, or Silver Bullet, but it did have an awesome launch and some decent weightlessness on the backwards spike. Jaguar’s entire queue was inside a pyramid! It was pretty creepy for a family coaster. There’s human skulls! Jaguar, on the other hand, was kind of rough. It was still a fun family coaster, and gave a very long ride, but it didn’t really have any outstanding elements. 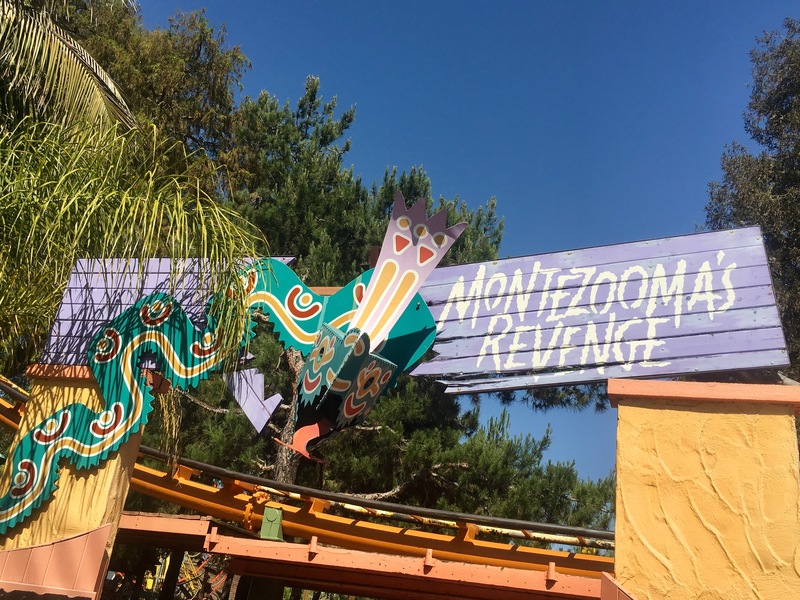 I guess going through Montezooma’s loop was pretty cool though. 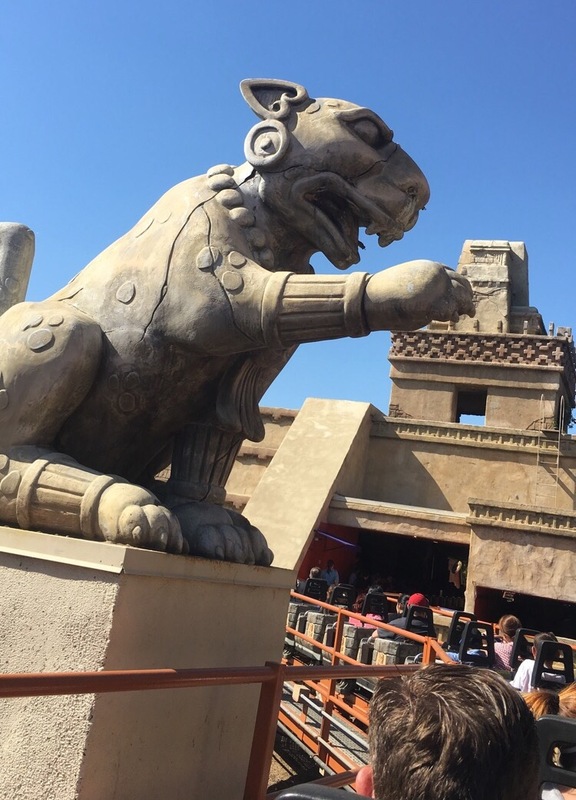 There were also some neat Jaguar statues on the brake run! After that, I quickly went and bought a mug to commemorate the trip, and then we left the park. It was obviously a pretty short trip, but we did get a pretty good taste for what Knott’s had to offer. It’s easily one of my favorite parks I’ve ever been to, and I look forward to coming back again some day!